We are very proud of our sponsors and partners. These are companies and organisations at the very heart of the sponsorship industry, representing as they do every aspect of the sector and they have been loyal supporters of the Awards for many years. They work with us to spread the word about the Awards and to encourage their membership to enter. All our sponsors and partners are profiled and have links to their own sites on the following pages - please contact them and make use of their expertise. 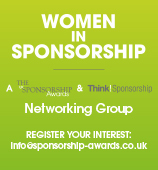 If you are interested in joining forces with the Sponsorship Awards, please email us by clicking here.